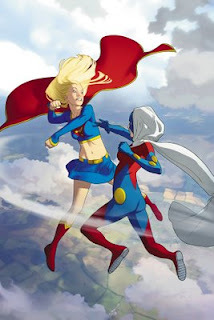 And here is the cover for Supergirl 41. For whatever reason, the DC heroes always seem to beg for very saturated, pure colors. When I have tried to pull things back, it always looks odd to me, even though I often shy away from super-saturated colors in my other work. So once again, Supergirl and Superwoman are soaked with red and blue. Something else to keep in mind about the covers I post here is that they are designed for print on a comic book, and as a result, they will never look as bright and shiny in the real world as they do on a glowing computer display. I have learned over the years to push the levels about 10% further than I think I should while working on the computer. By the time it sees print, it usually looks about right. Early on in my career, I was often frustrated that my printed work always seemed washed-out compared to what I was staring at in Photoshop. I didn't stop to consider the properties and limitations of ink on paper, just one potential pitfall of working digitally. I suppose I could knock the saturation back just a touch on the JPEG's I post here to better approximate the printed look, or better yet, you folks can go buy the books!